The outer persona exhibited by a bookstore is always the public’s first glimpse into the establishment. This critical component carries a significant amount of weight when it comes to attracting customers, seeing as it is the most direct reflection of the business. While the abandoned factory of John K. King Used and Rare Books certainly possesses all the aesthetics one would expect from a run-down facility like itself, the inner contents paint a much different picture. As the old saying goes, “you shouldn’t judge a book by its cover,” and this expansive bookstore is true embodiment of the time-tested cliche. Though its exterior may give the impression of a lack luster building, I can assure you the contents within echo a sense of uniqueness that you would be hard pressed to find elsewhere. Any inquisitive shopper that happens to venture into John K. King’s establishment will immediately realize the daunting adventure that stands before them. Within its walls lie four immense floors packed to the brim with books of various genres and types. The amount of content contained within the bookstore is intimidating to say the least, but to the avail of any curious customer, and much more so myself, King has floor plans readily available to help navigate this multi-level labyrinth of literature. With a cursory glance of the map, you’ll realize that the structural organization of the business is relatively consistent across the levels. On each floor, the outer walls are lined with books, while a series of shelves parallel the inner space, leaving just enough room for navigation. In keeping with its status as an old factory, the only access to the upper levels of the store is via the stairwell at the front. If the insane number of genres contained on each floor still isn’t enough to convince you of just how packed this bookstore is, then I implore you to make note of the telephones on the upper three levels. Put in place by the owner himself, these direct lines to the front desk are ready to assist anyone in need of help with their book pursuits. Although John K. King Used and Rare Books is a marvel among independent bookstores, the layout of its inner contents certainly catch my eye as I traverse its multiple floors. The amount of variety offered from a used bookstore is bound to be large, especially when its inventory is as big as King’s. However, the degree to which the subject matter extends is unlike anything I’ve seen before in my literary visits. To gain the greatest understanding of just how obscure the content of John K. King’s store gets, the first and fourth floors will be analyzed under a comparative lens. “I, for one, have in mind something less obscure, something more palpable…” (Benjamin 59) Some of the first words uttered by Walter Benjamin in his essay, “Unpacking My Library,” capture the first floor of John K. King Used and Rare Books more perfectly than I could have ever expected. If there is any term that could categorize the literature on this ground level, it would have to be nothing other than ordinary. Some of the most prevalent genres on display are none other than classics, history books, and art pieces. Material like this is not only common to any reputable used bookstore, but expected. Even though this may be typical stock, there is an underlying reason to this organizational decision. The ground floor is the very first room that customers walk into when they decide to pay a visit to King’s store, and, as such, should succeed in capturing their attention. This is a business strategy more than anything, but it nevertheless contributes to how we understand the inner workings of this bookstore. Art comprises a considerable portion of the ground floor, and most likely so because its nature as an aesthetic stimulant is bound to draw attention and attract consumers. From here, the other shelves are lined with material that would have the greatest possibility of interesting the average customer. Bibles and classics are some of the most widely read pieces of literature, and even a specific category like Michigan history is obviously appealing to the native populace. When you take a critical look at the genres of the first floor with consideration for the natives of Detroit, you can clearly identify the reasoning behind John K. King’s beginning floor plan. On the highest level of the building lies the epitome of obscurity that I so aptly derived my title from. “Not even both factors together suffice for the establishment of a real library, which is always somewhat impenetrable and at the same time uniquely itself.” (Benjamin 63) To describe the content of the fourth floor as unique would only be scraping the tip of the iceberg that is King’s boundless wealth of books. Most of the genres in this section are not just uncommon, but oddly specific to boot. I cannot recall ever visiting a bookstore in which there were shelves devoted to the likes of presidential biographies, coins, or something as narrow as the Kennedy family. Supporting the same notion as that which was present on floor one, floor four is partly the result of consumer appeal. Genre’s like library science or LGBT aren’t exactly popular areas of interest, and thus their placement on the uppermost floor only follows suit. It’s perfectly reasonable to place the lesser desired content at the top, so that which is more demanded is not as out of the way for the customer. Despite this, John K. King’s decision to not only take in this obscure material, but make room for it on his shelves is a deeper sign of his appreciation for literature of this caliber. Aside from the practicality of this organizational layout, placing all of the odd content at the top could also be interpreted as a matter of value. It was only in one of my recent classes that the idea of placing the most prized material on the top floor was brought to my attention. I had never given this much thought, but a retrospective look at some of the bookstores that I personally visited brought a sense of legitimacy to this argument. There was indeed a tendency to keep the most valuable books on the uppermost level, and this could have certainly been part of the influence behind King’s floor plan. He is, after all, the owner of a used independent bookstore, and these people are most likely to appreciate literature for what it is, as described by Walter Benjamin himself. No matter what combination of factors contributed to the inner identity of John K. King Used and Rare Books, its status as a unique entity is all its own. The contents of a bookstore will always be the defining component to its place in the literary world. 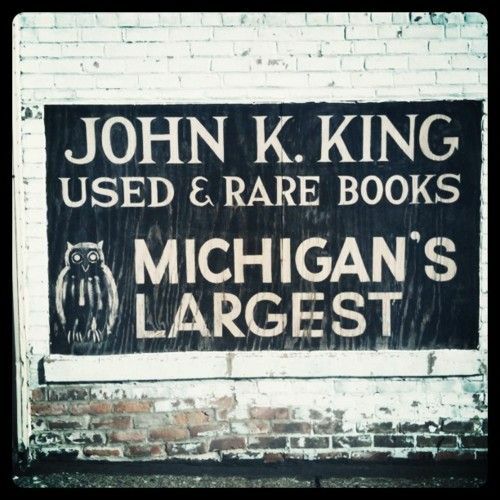 Books that stack shelves are the reason customers flock to establishments like John K. King’s in the first place. They have a desire for literature, and they’re looking for an outlet that can satisfy their various inquiries. For most, these desires rarely extend beyond the common novel, and King is fully equipped to accommodate them. However, even if your tastes are a little more obscure than the average reader, you can be sure to find solace in the extensive collections of John K. King Used and Rare Books.